How to Root Verizon Galaxy Note 3! ~ AndroidRootz.com | Source for Android Rooting, ROMS, Tricks and More! 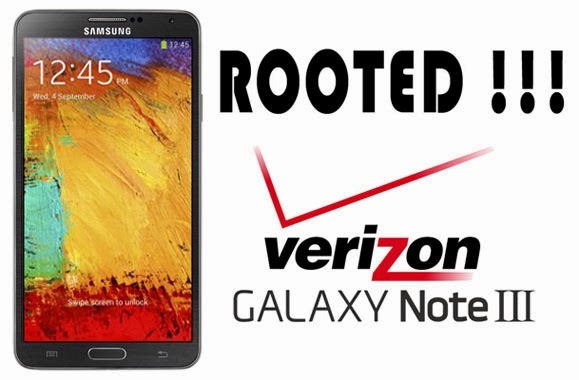 How to Root Verizon Galaxy Note 3! This guide will show you step-by-step how to root your SM-N900V Verizon Galaxy Note 3. This root method is going to be a little different than your usual Samsung rooting guides since Knox is included in the Verizon Galaxy Note 3. With Samsung Knox security the Android community needed to find a work around to root the device without alerting the security software and letting Samsung know you modified your device some way. Currently this guide will root your Verizon Galaxy Note 3, but there is still no way of installing a custom recovery (CWM/TWRP) yet. Once the Android community finds a way I will be releasing a guide on this site, so stayed tuned! Follow the guide below to root the Verizon Galaxy Note 3! 1. Remove external SD card from your phone if you have one. 2. Now enter into Download Mode by turning off your phone. Then press and hold the volume down, power button, and home button at the same time. You will get to a screen to ask you to press the volume up to continue, press it. 3. Now plug in your microUSB to your phone and the USB cable to your computer.